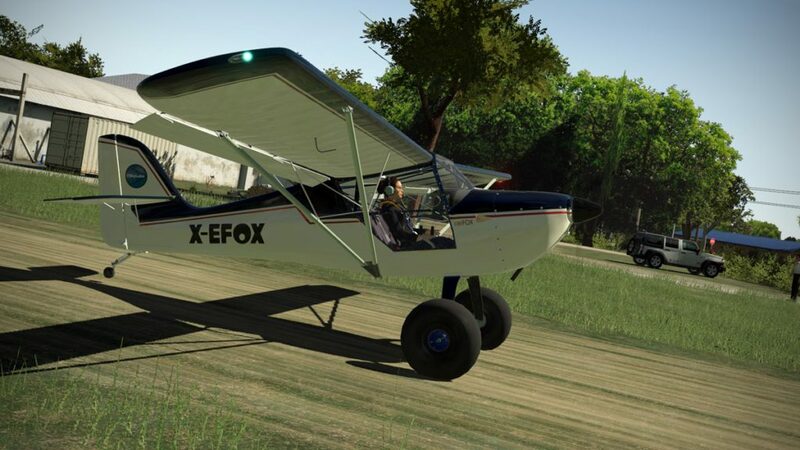 The EuroFOX for X-Plane is modeled after the real aircraft manufactured by Aeropro of Slovakia and marketed by Aerotrek in North America. 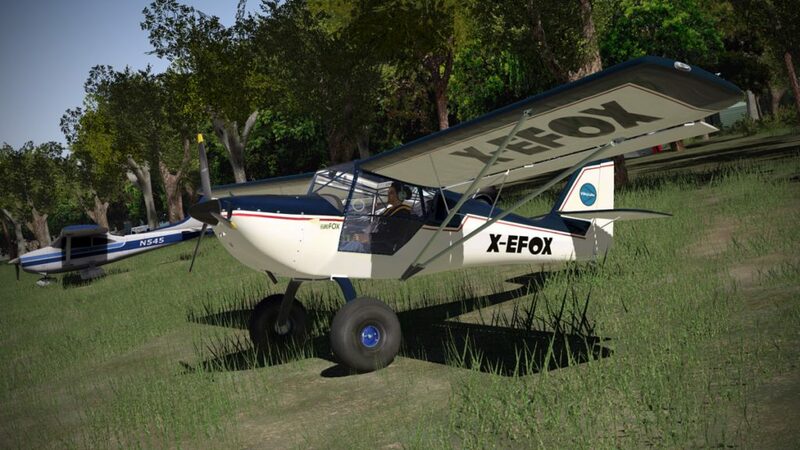 Sold in both kit and factory complete form, the “EuroFOX” comes in several variants including taildragger, tricycle gear, and tundra tire versions. They VSkyLabs package includes all three configurations. 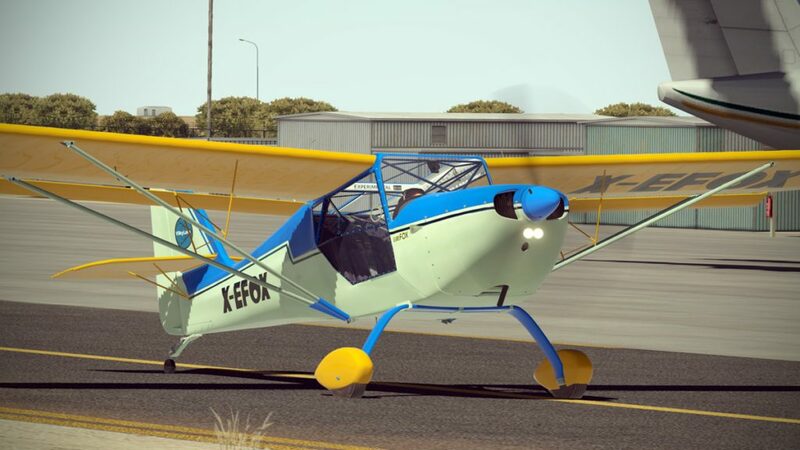 The lightweight EuroFOX (as modeled in X-Plane) is powered by a 80 h.p. 912UL Rotax engine featuring the distinct high RPM (5,800) whine of engines in that class. 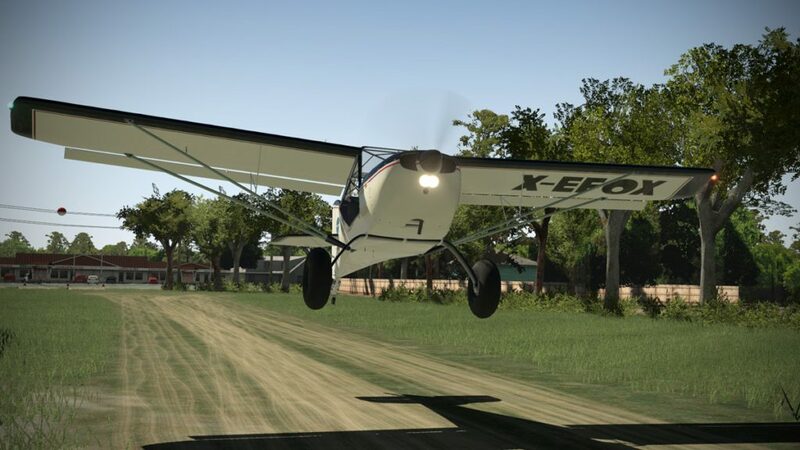 In most regards, the EuroFOX is operated just like any garden-variety light piston single with dual magnetos, electric starter, a generator, fuel pump, and carburetor heat. Throttle control is performed with a simple push/pull knob, though fine tuning via a Vernier rotation adjustment is planned. 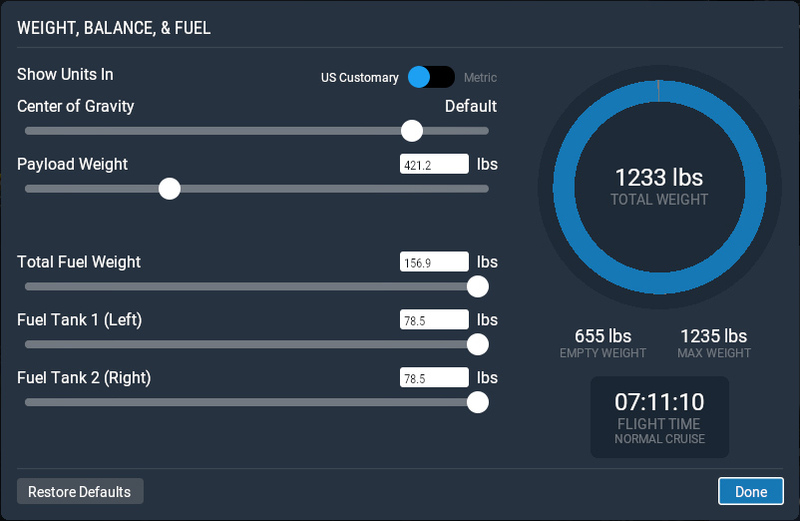 Fuel capacity is 22 U.S. gallons split between wing tanks with a 1.1 gallon equalizing tank in the fuselage. Fuel level indicators are embedded in the wing root and a 1.1 gallon warning light illuminates prior to things going quiet. 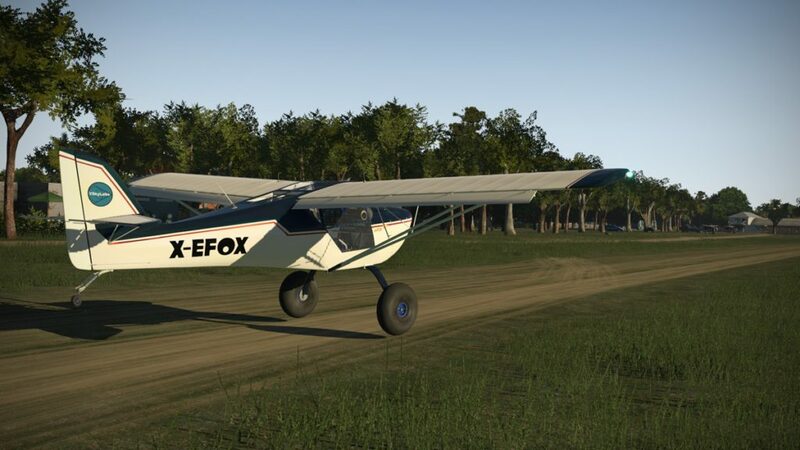 For flight controls, the EuroFOX has nearly full length, trailing edge flaperons for roll control, with traditional rudder and elevators for yaw and pitch. Barnstormers will be excited to note the aircraft is equipped with a control stick instead of a yoke. There are two actually, in case your white knuckled flight instructor reaches his limit. 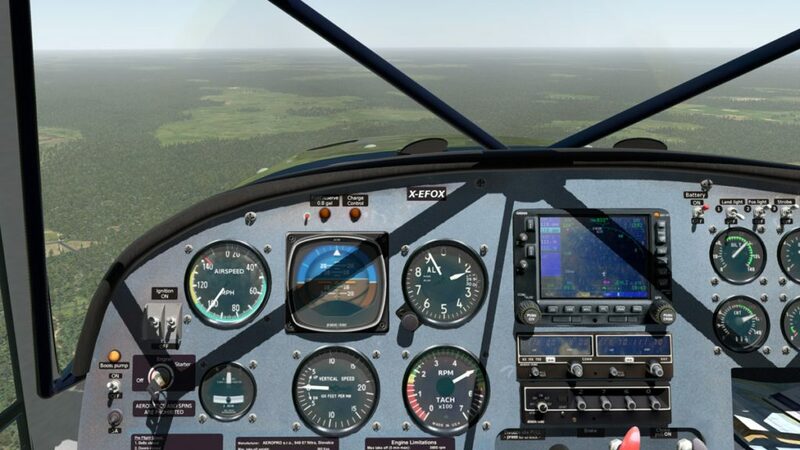 VSkyLabs did a fantastic job creating an authentic feeling cockpit environment. The instrument detailing is very good and the slightly smudged and dusty look of the glass and Garmin screens looks great – particularly when bathed in full sunlight. 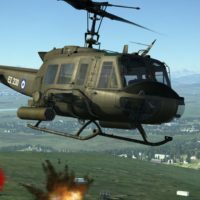 The developer has noted that a “cleaner” cockpit may be coming, but I’d actually prefer the option of both if that is the case. Peering closer, the bezels and instrument casings are nicely modeled in 3D and cast nice shadows, giving a fantastic feel of depth to the panel, but if you look really, really close, you can see that the internals of the instruments are not actually 3D modeled in that the needles don’t float above the faces. 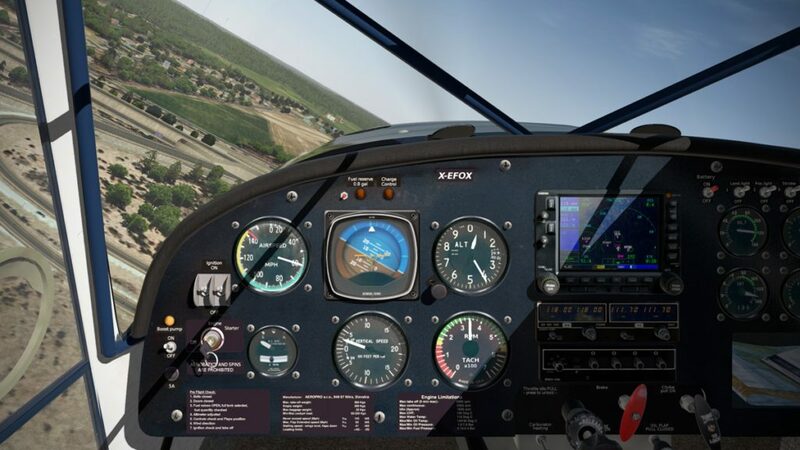 You have to get very close to notice that though, and for this budget title ($8.50 US) the cockpit is superb with typical X-Plane instrumentation fluidity and clarity. 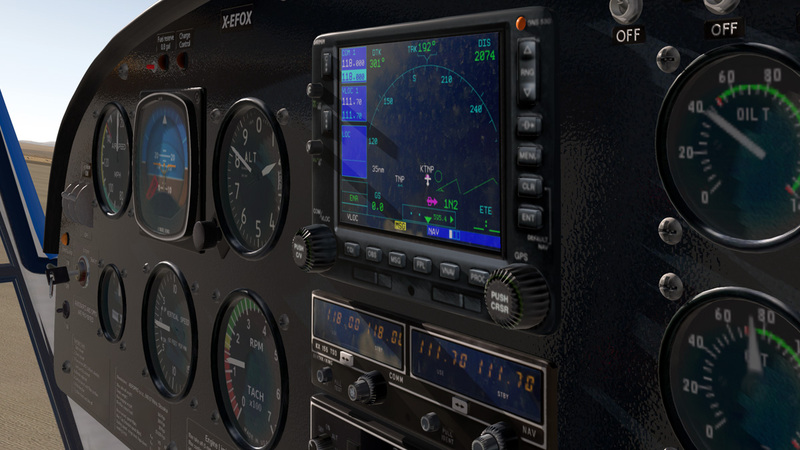 The panel is psuedo-IFR equipped, although the EuroFOX is not certified for IFR or night flight. 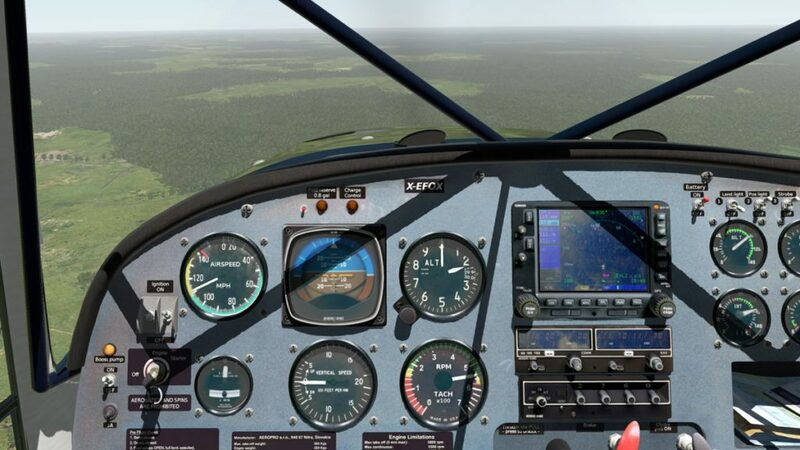 In a pinch, the traditional six-pack of steam gauges (minus the directional gyro/HSI) can be used in conjunction with the compass on the Garmin GPS to fly IFR approaches. 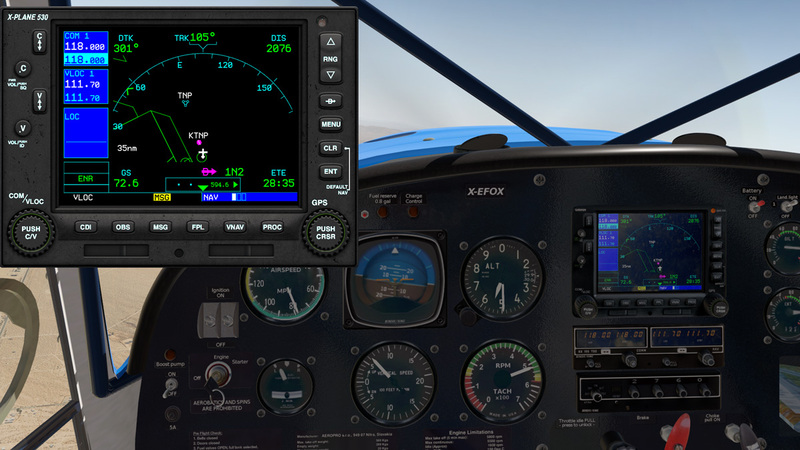 The panel uses the default X-Plane Garmin 530, which is quite capable and allows you to shoot GPS approaches (illegally). 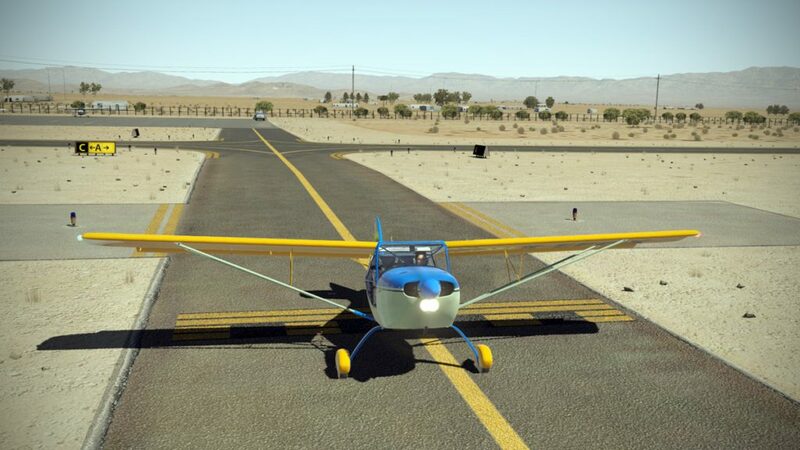 The standard wheeled taildragger and tundra tire wheel configurations both require a bit of peering over and around the nose when taxiing to avoid running into things, but moving the viewpoint in X-Plane (or using VR or TrackIR) is so easy that it isn’t a hassle. Once the tail is lifted slightly, visibility improves drastically. A good burst of power is required to get the EuroFOX moving from a dead stop. For the taildraggers, a bit of rudder, differential braking, and some bursts of power get the aircraft moving in the right direction. The tricycle gear configuration has a steerable nosewheel. 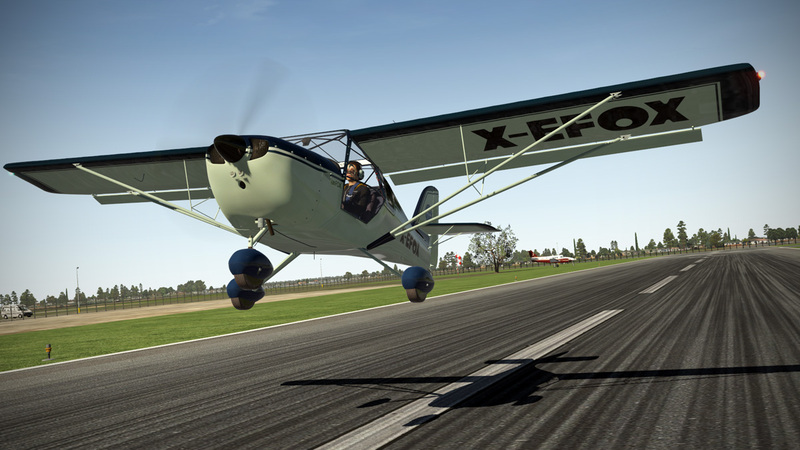 X-Plane physics have always felt more dynamic than FSX/P3D, so it is no surprise that I enjoyed taxiing the EuroFOX and all of the handling throughout the takeoff and landing rolls. I tested the EuroFOX at maximum gross weight (1,235 lbs.) and the performance was fairly well in-line with the published book numbers. 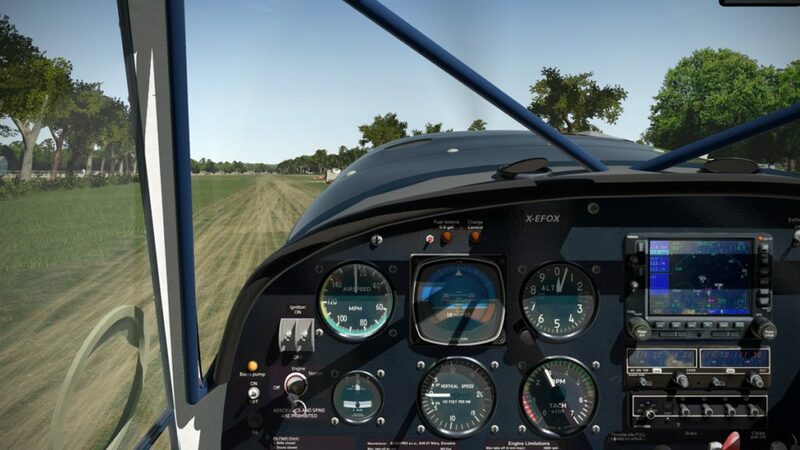 Using the published technique of applying maximum power, accelerating, then gradually adding back pressure at around 45 mph, I reached liftoff after a 650′ ground roll compared to a POH value of around 460′, but I might not have been as aggressive with my elevator input as a certification pilot and I was using the tricycle gear model – so the tailwheel configuration would have lifted off sooner. 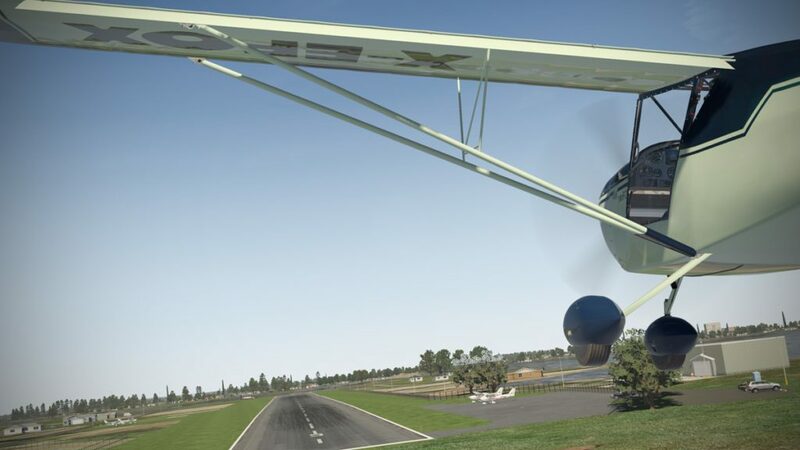 Landing performance is similarly impressive – at gross weight, using the recommended short final approach speed of 55 mph, then going to idle power and holding off until around 45 mph, I managed a landing roll of just a smidge over 500′ compared to the book value of 488′. 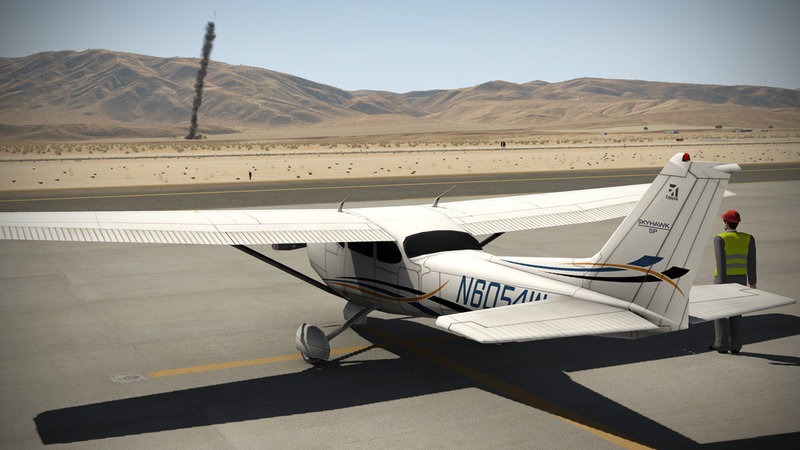 Reducing the gross weight to around 50%, with just 45 minutes worth of fuel onboard, I re-ran the tests to see what an even lighter LSA could do and came up with a takeoff run of around 350′ and a landing distance of 380′. 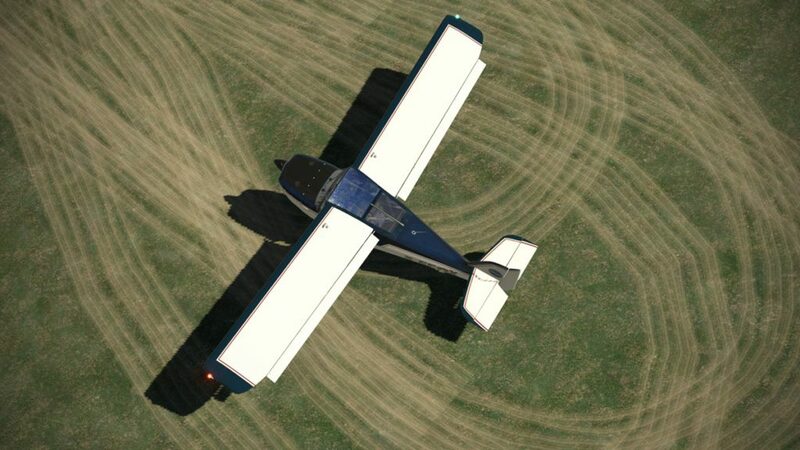 If I mow the grass just right at my home, I might be able to operate the FOX from BeachAV8R Air Park! 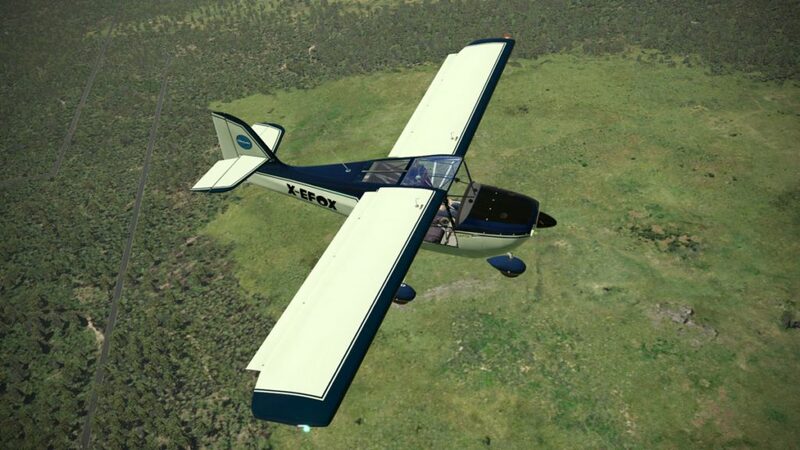 Most LSA pilots tend to be the low altitude, look at the scenery types. 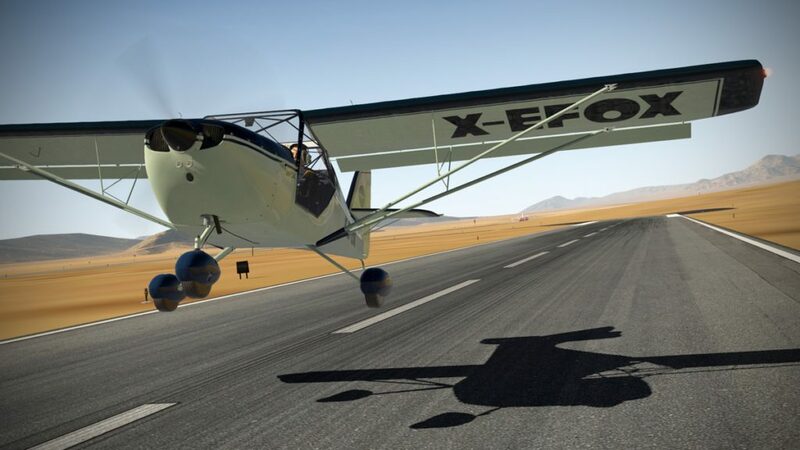 Once you do get to your cruise altitude in the EuroFOX, the airspeed will settle in at around 112 mph at a high RPM setting of 5,500 or about 100 mph at 5,000 RPM. Never exceed speed is 143 mph, which you’ll only reach in a dive. 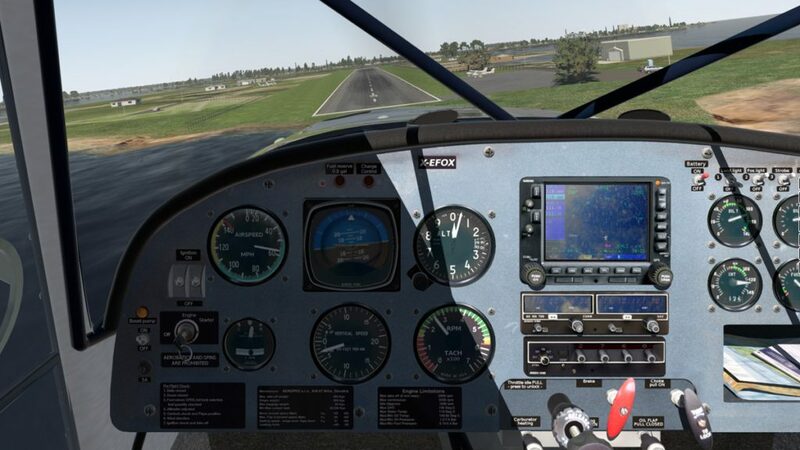 John started to reconsider his flight training when he saw what happened to BeachAV8R when he exceeded Vne in his EuroFOX…. 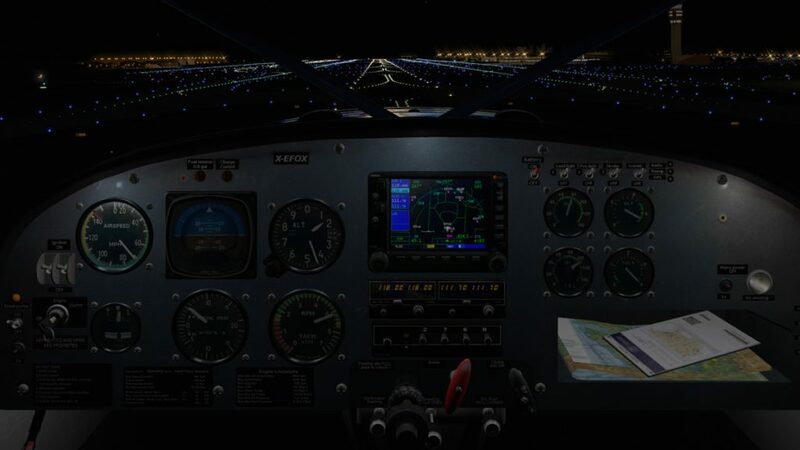 Should you find yourself flying illegally at night (in IFR no less! 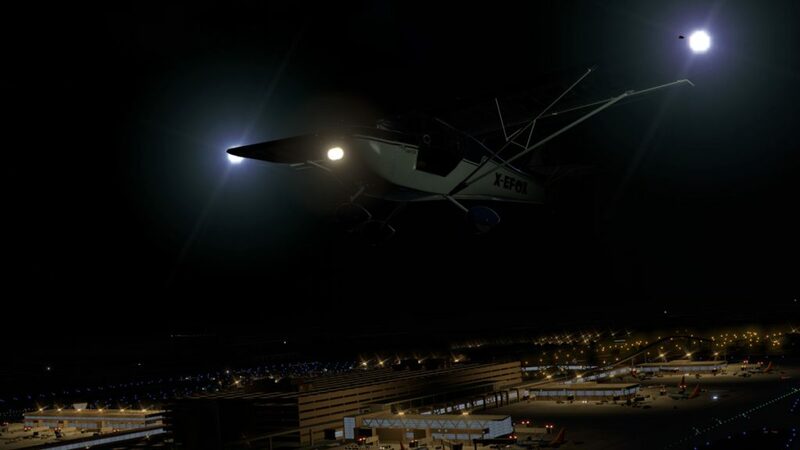 ), the EuroFOX is equipped with non-regulation lights that will help you be seen, and illuminate the runway. Strobes, a taxi and landing light, and low voltage LED panel lights that automatically come on will make the cockpit cozy for all your illicit flying. 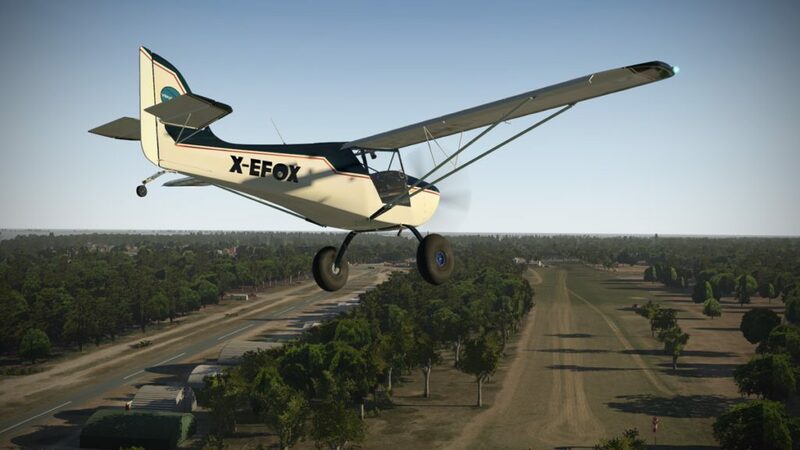 The VSkyLabs EuroFOX is a super fun little bird that packs a lot into its budget price. 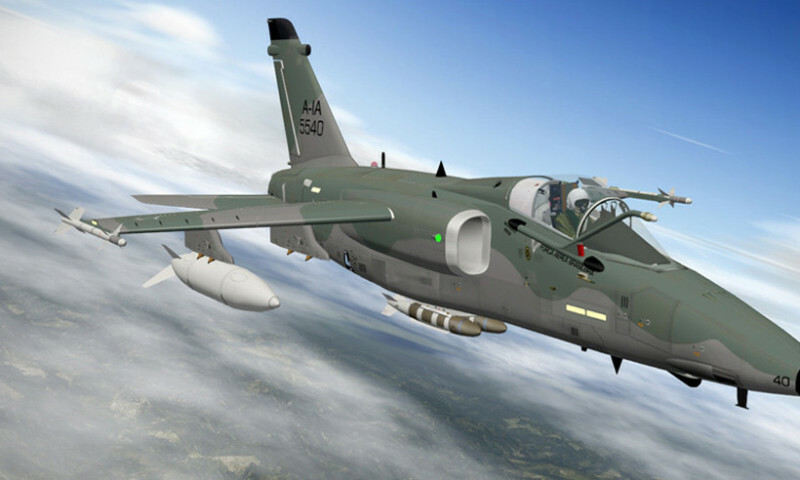 It is the perfect airplane for bombing into short strips and taking in VFR scenery, and even for poking your head into the clouds once in awhile. 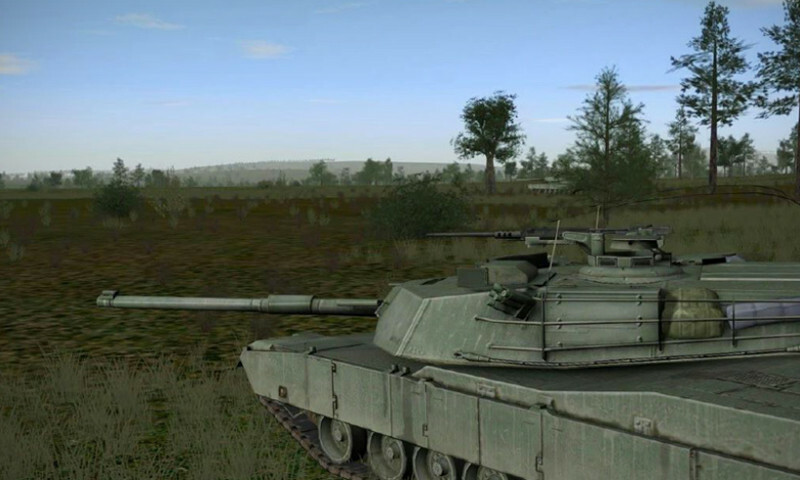 The developer has been continuously tweaking and updating the models, adding functionality and refining the performance. I look forward to seeing what else comes down the pipe from VSkyLabs as his quirky lineup of aircraft. Some of those panel shots look photo realistic - wow! Nice lighting. 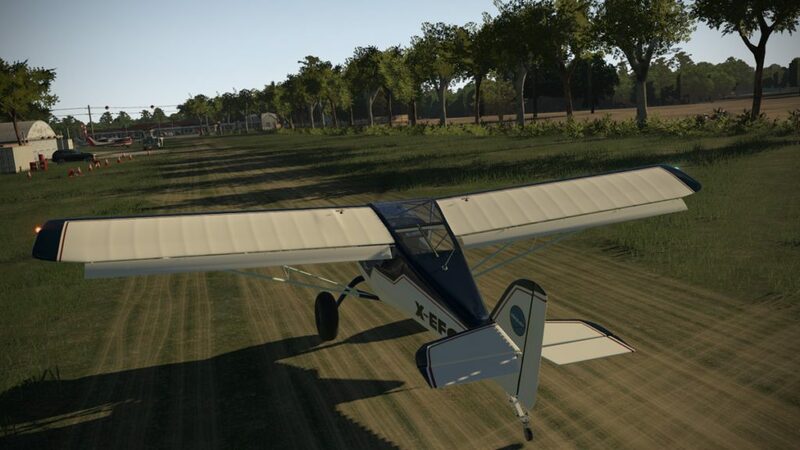 During the past weeks, I’ve been focusing mainly on bringing the new VSKYLABS Tecnam P2006T Project to it’s initial stable point towards its release. 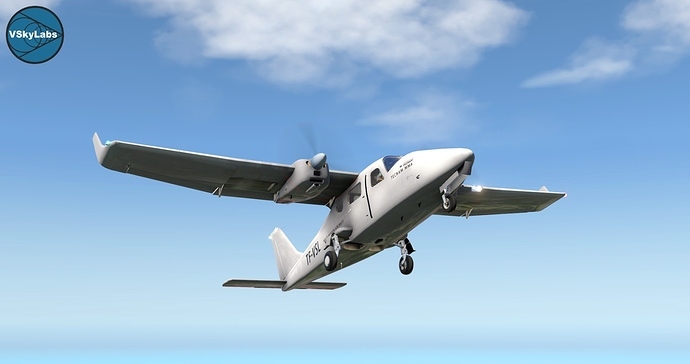 The P2006T will be released within couple of hours. As the rest of my projects, the ‘Initial release version’ will start the journey of the long-term development phase. 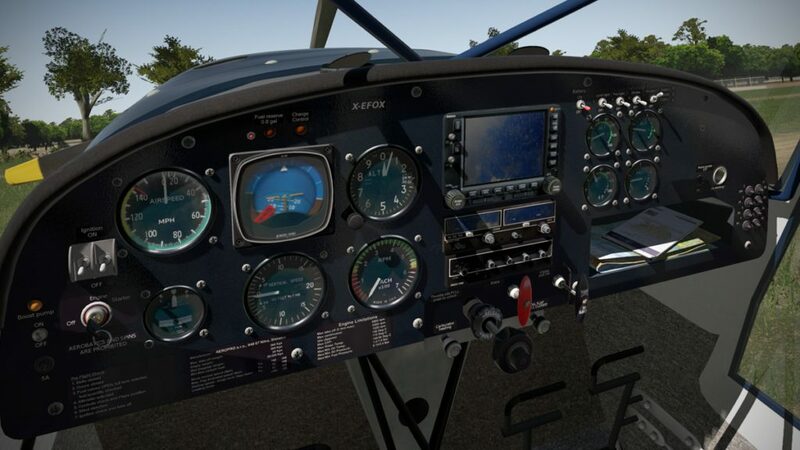 During the months of May, June 2017, I’ll be focusing on executing major update releases for the VSKYLABS Trikes, Autogyro, EuroFOX and Phoenix motor glider packages. 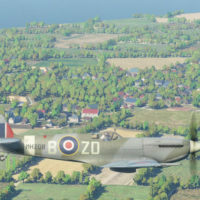 Updates will include aircraft performance tuning, cockpit enhancements, 3D modeling and internal engineering refinements. 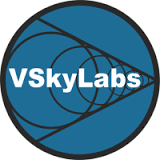 Other VSKYLABS packages are also to be updated, but only after these Four packages updates will be completed. Wonderful article. Gonna buy this AC right away! 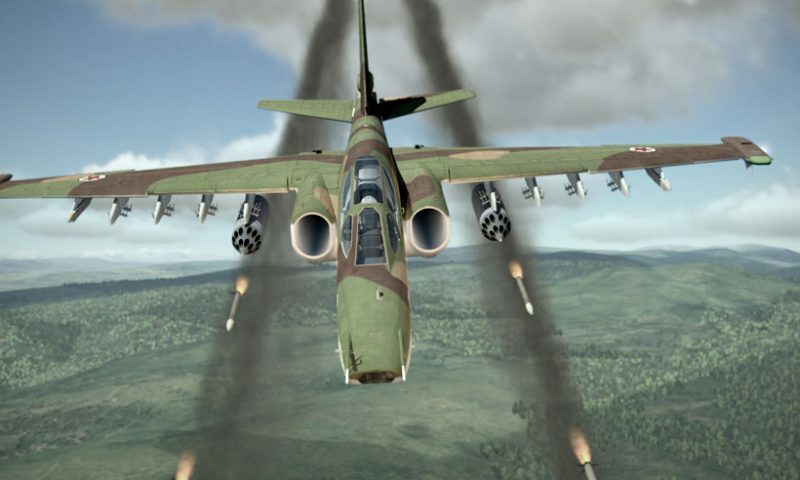 What scenery was showcased with this Aircraft? 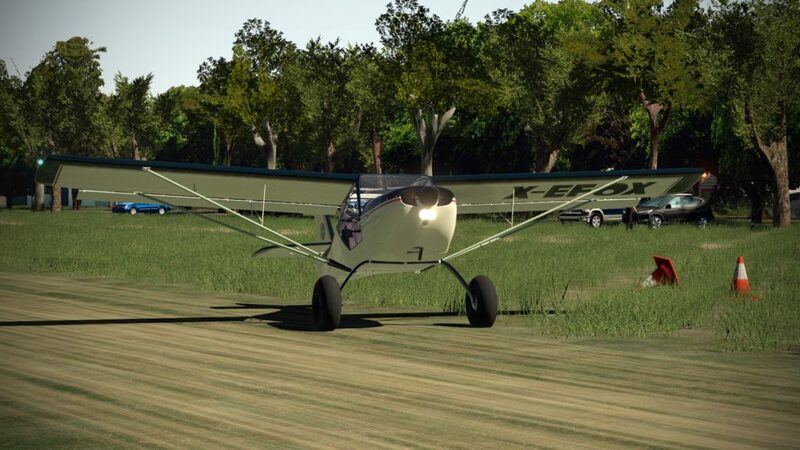 I really like that grass runway scenery! Awesome! Thank you for getting back to me! !